Vietnam has been on our travel list for a long time, and finally, we managed to organize one month trip around the country. Different from the countries we visited in this two years travelling the world, in Vietnam we need to apply for the tourist visa in advance. 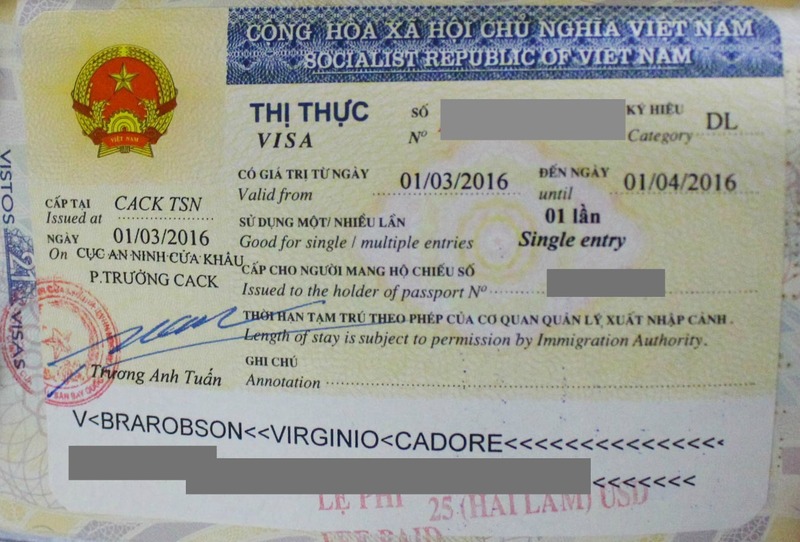 So our first post about this trip it’s a very informative and practical one: How to get the online Vietnam tourist visa, or also called Vietnam Visa On Arrival. First of all, do you need a tourist visa for Vietnam? Not sure? So check on the Vietnam Embassy website on your country, there are few nationalities that don’t need to apply for the Vietnam tourist visa and can receive the immigration stamp for free. We are not the lucky ones, we have Brazilian passport so we need to apply for the Vietnamese tourist visa and pay for the process. If you are on the same boat as us, there are a few things you must know before getting your Vietnamese Visa. You can apply for a tourist visa at a Vietnamese Embassy, or you can do the process for the Vietnam tourist visa online and get the VOA [Vietnam Visa On Arrival]. This type of visa is only issued if you gonna arrive in Vietnam by air, if you are planning to cross the border by bus it’s a different story, you must get the visa via the embassy. A third option to get your Vietnamese Visa is being discussed by the government, we’ll update the post as soon as we receive the right information. How to apply for Vietnam Tourist Visa or Vietnam Visa on Arrival? To apply for the Vietnam visa online you need to a find a trustworthy online company that will handle the paperwork and give you all the information and forms needed for the process. 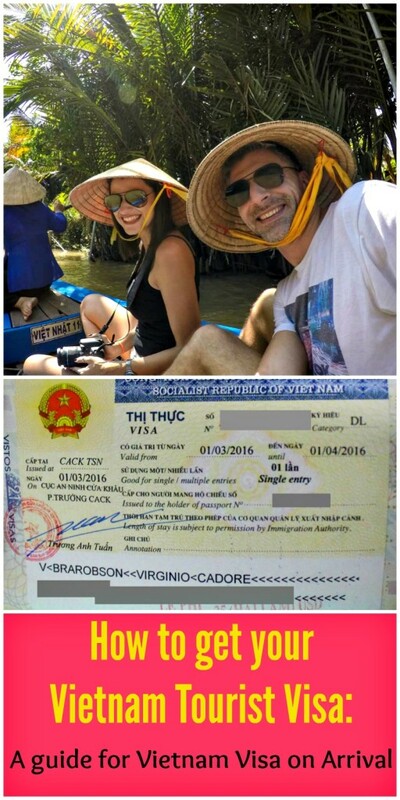 We choose Vietnam-visa.com and the process was really easy and smooth. You have to fill the form online and pay the tourist visa application fee. The online form must have all your personal details, your travel dates, the duration of your trip and if you are applying for Vietnam online visa single entry or multiple entries. Then the company will send your details to the Vietnam Immigration Department, they will issue a letter confirming that you are travelling to Vietnam and that your visa on arrival process is open. Vietnam-Visa.com will send to you another form that you must print and fill by hand, also the copy of the immigration letter. 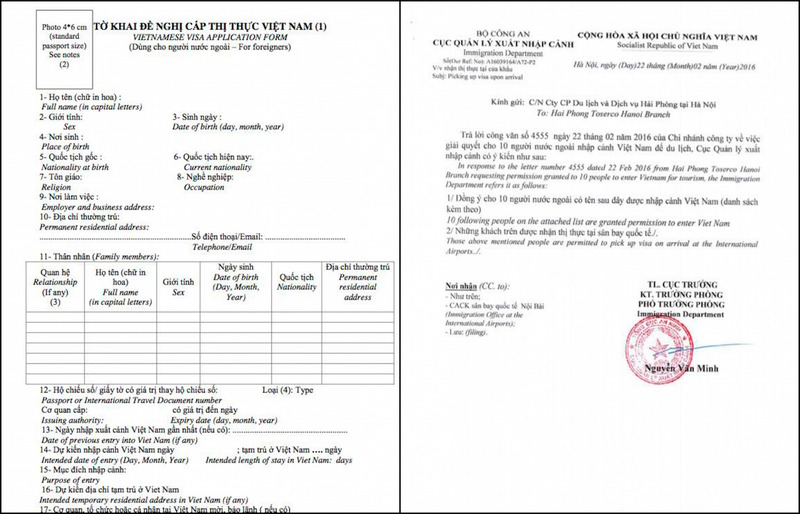 With these two documents and your passport, you can fly to Vietnam. Keep these documents on your hand luggage, some airlines will check your tourist visa application before boarding the plane. When you arrive at the airport you must find the Landing Visa signal. 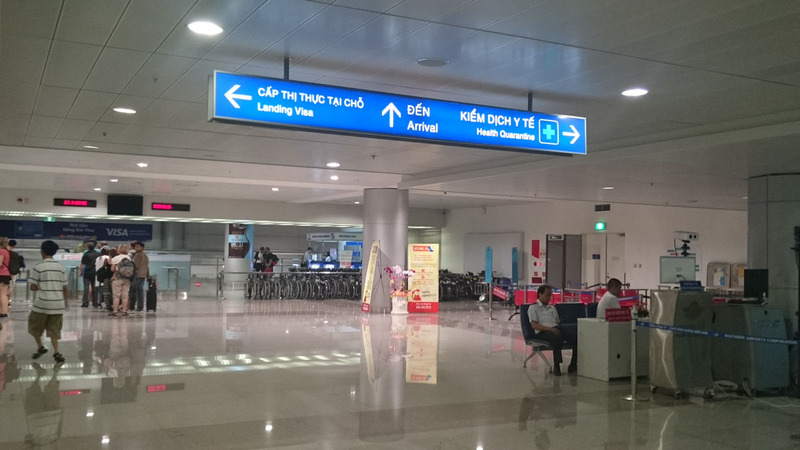 At Ho Chi Minh airport is very easy to find it, follow the signs and you will see the counter and seats just beside the passport control. At the Landing Visa counter, you will give them the form filled by you, the letter from Vietnam-visa.com and two passport photos. They will get your documents and ask you to wait. Take a seat and wait until the officer call your name. We landed in Ho Chi Minh around 5:30pm, there was a small queue at the Landing Visa counter and we waited about 40 minutes to finish the visa on arrival process. When the immigration officer gives back your passport with the Vietnam tourist visa stuck on it, you have to pay the visa fee. After that you are free to pass by the passport control and receive the welcoming stamp. How much is the online application for the Vietnam Tourist Visa on Arrival? To get the Vietnamese visa on arrival you have to pay two fees. The first one is paid to the company, in our case Vietnam-visa.com. The payment is online, and you could pay via credit card, PayPal and even Western Union. There are a few companies processing the visas for Vietnam, and the price can vary among them. I would suggest you not to choose the company based only on the price, choose one that you heard positive reviews. Be smart and avoid online scams. Your travel to Vietnam depends on the visa, so make sure you choose the right company to start your trip hassle free. Then the second fee you pay is for the Vietnam Tourist Visa itself, 25 usd in cash straight to the Immigration officer. Very easy! Ahhh, don’t forget your passport photos, otherwise they will take the photos and you will be charged an extra amount for it. The visa online is easier than the visa you get from the Vietnam Embassy? We never did the process to get the visa for Vietnam via an Embassy, but based on our researches, we figured out that the process for Vietnamese visa on arrival is easier and faster than via Embassy. You don’t need to give or send your passport to anywhere. You don’t need to wait for the embassy, and for the post office to process your documents and deliver them. What you pay for the Vietnam visa online is almost the same you would pay for Vietnam Embassy. Some cases, like in Brasil, the online Vietnamese visa application is cheaper than doing via embassy. The application for Vietnam tourist visa on arrival takes about 2 working days. And the Vietnam visa you get through the online process have the same rights, conditions and limitations as the visa issued by the Vietnam Embassy. Would we recommend to do the Vietnam Tourist Visa on Arrival process and the services of Vietnam-visa.com? Sure! The online process was very easy and fast. Vietnam-visa.com gave us a quick reply, all our documents and letter were correct, and we had no problem when we arrived at the immigration office in the airport. Also they gave us all the information about how to find the Landing Visa counter, that might be a queue there and we would have to wait. Very clear and straightforward information. Apart from the time we had to wait everything was super easy and smooth!!! Travelling to Vietnam soon?! Pin this post for later! PS: This post was written in partnership with Vietnam-visa.com, and as usual you receive our honest option. You have done well in describing the fairly tedious process of acquiring visa to enter Vietnam. I agree that the online visa process is much easier and less time consuming that visiting a Vietnam consulate near your place of residency. Following your steps above will help simplify the process for travellers. Thanks for pulling all this together and hope you enjoyed your time in HCMC and the rest of Vietnam. Thanks for stopping by Brad! As you said, applying for visas can be a very tedious process. Thanks God it didn´t took so long for us! It was very easy Mark! Usually I hate all the visa process and all the paper work we need ot organize, but this time in Vietnam was very easy and smooth. I think your guide is fantastic in easing people through the Vietnam visa process. It can be very daunting to apply for visas sometimes, especially when we so often these days we don’t have to and they are granted on arrival in certain countries. That´s true, travelling nowadays is so easy that sometimes we forgot to check if we need visa in advance or not. But the process online for Vietnam visa is so easy and fast that surprised me! I might be heading out there soon so this is very handy information. Thanks so much for sharing! Hope you come to Vietnam soon, the country is very interesting! Very useful information! I’ll share this post with a couple of friends who are getting married on June and are planning a viet honeymoon: not sure if they’ve settle everything with visa, so maybe that’s precious for them! A honeymoon in Vietnam, what a cool idea, completely different destination, not the tradicional romantic ones. Love it! Great info. I had no idea you could do the Vietnam visa on-arrival. We went the embassy route when we traveled to Vietnam which does take a while. Also, physically mailing a passport always makes me nervous! That is one document you do not want to get lost in the post. The on-arrival visa seems like the best route next time we fly into Vietnam. I´m with you, I hate to mail my passport, always feel something bad will gonna happen with it. Especially now that we are full time travelling, no way we can send our passport to the Embassy and stay in a different country without proper document. The process for the visa online was the best solution ever. Great advice – I’m from Australia, so we also need to arrange a visa for visiting Vietnam. I would definitely be organizing mine beforehand, though I do have friends who have taken an official letter with them and received it on arrival. I think I would rather be prepared in advance though. Thanks for sharing your experience. You are right Meg, travel with all your documents organize and the visa process open it´s easier and safer. You never know how it will be at the immigration desk, the officer might not accept your letter, or get in doubt about the document authenticity. I wouldn’t take the risk! I hate wasting time with visas. Fortunately, most of the places I’ve travelled either don’t require a visa at all or the process of getting one is fairly easy. This seems like a good alternative for those more bureaucratic ones. Great summary os what’s needed and how it works! Before our trip to Vietnam I was worried about how would be the process and the bureaucracy, but turned out to be fairly easy and fast. I totally recommend the visa online for Vietnam, specially for people like us, that hate to waste time and energy. I used a different service that’s basically the same (now they send me discount emails every month or so). It was so easy, but it was weird to see someone else’s name along with mine on the form they sent me–they just apply for the visa for multiple people at once, so not really a problem. Very cool that you can apply for a 3-month, multiple entry visa as well. It´s very weird to see other people´s name on the same letter, but that´s how it works. I was in doubt about it, but the visa company explained us that is normal. The multiple entry visa is very handy for people how want to travel in Vietnam, Cambodia and Laos without a problem to cross the border. So cool that you visit Vietnam 3 years ago, I bet it was a bit different from nowadays. What a crazy country! Ho Chi Minh is so raw, wowww! The visa stamp didn’t change, it still take the whole page of our passport! Thanks for stopping by! Awesome post! This will be very handy! Thank you! 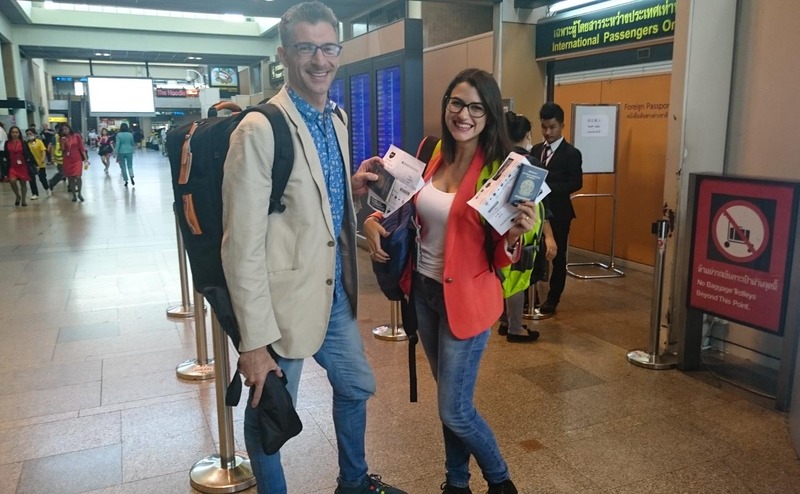 I carry a Philippine passport and I have never had to worry about getting a visa for Vietnam but I have had my fair share of visa acquirement stories and blog posts like this one have helped me a great deal. Hope you guys thoroughly enjoyed it there! Vegetables are always fresh! You are right, the veggies in Vietnam are fresh and delicious, can get enough of the morning glory stir fried with garlic, yummy!! I can imagine that Filipino passport need visa for many countries, as our Brazilian one, but it´s ok we can handle all the bureaucracy! Cheers and happy travels sweet! That´s true Ria, the immigration office can get packed of travellers with many planes arrive in the same time. But even though, I think the wait is worth, I rather wait few hours there, than post my passport to the Embassy and wait for weeks to get the visa! Great post guys, really useful. I wish it had been around a few years back when I first went to Hanoi. I was really anxious about using the VOA and the Internet, but it worked a treat. Been to Hanoi three times and it’s worked perfectly every trip. Have fun in Vietnam! Simply awesome country. Vietnam is incredible indeed… I was worried about the Visa online too, have heard many stories about scam. But ours worked perfectly!! Hello! Thanks so much for your comprehensive post, I’m surprised how difficult it is to find clear, reliable info about vietnam visas! Have you heard about the spike in prices for US citizens? I understand that in August of this year 1 month and 6 month visas are no longer available for US citizens and that the price for a multi entry one year visa is a cumulative 160$. I’d love for all the info I read about this change to be incorrect. Curious if you’ve heard the rumors or if you stay up to date on any of that:) Thanks! Note that the Visa On Arrival works only for air travel, and you must arrive in Vietnam through the selected airports: Noi Bai Airport (Hanoi city), Tan Son Nhat Airport (Ho Chi Minh City city), Cam Ranh Airport (Nha Trang city) and Da Nang Airport (Da Nang city). The cost of the Visa On Arrival for US citizens is 35 USD per person for 1 Year Multiple Entry Visa. Good to know, I’m hoping to head there in April so will definitely check if I need a visa first. If you need a visa to Vietnam the best way is to apply online for Visa on Arrival, easy and you don’t need to go to the embassy. Gosh, this does seem like a tedious and long-winded process. Great to have your guide on how to navigate the process end-to-end. Visa bureaucracy are always tedious. But with this online visa application it was so simple and fast to get the Vietnam Tourist Visa. We loved it! Thanks for all the great information! It’s always hard to know exactly what you need, so a service like this sounds perfect. We are hoping to head to Vietnam later this year so this will be extremely helpful! For us the application online for the Visa on Arrival was perfect as we were already travelling and we couldn’t go to the Vietnam Embassy. Give a try, it’s hassle free and fast. Great practical info! Thank you. I haven’t been in Vietnam yet, but it is on my list. Saving your post! Your post is so good I think every travel agent out there should print it off to give to clients they book to Vietnam. You make it so easy and understandable that even the most timid of travelers can purchase their visa and make the entry into Hanoi a breeze! Thanks for such lovely comment Nancy! The idea is to help people to travel more and better, and Visa process sometimes can be overwhelming. I haven’t been to Vietnam yet, but it is quickly climbing the list of places I want to go next. This is super helpful information, especially since getting to an embassy isn’t always an option! The application online for Vietnam Visa on Arrival is the best way to get the visa when you are already travelling or if you live far from the Embassy. That is a very helpful post. 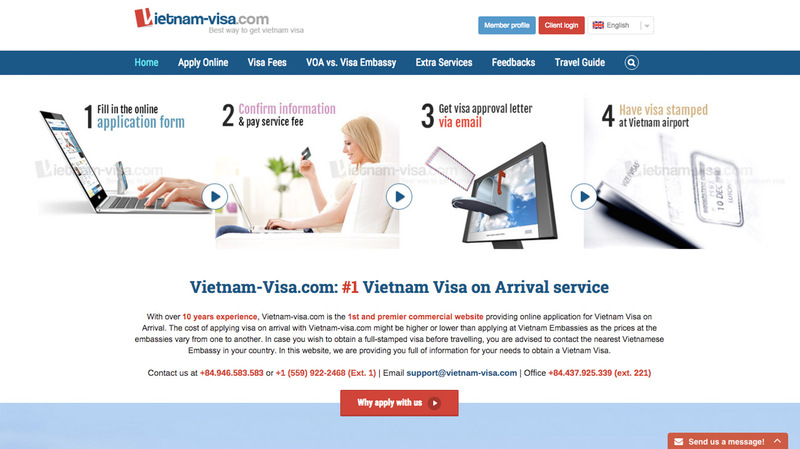 I didn’t know they were sites like Vietnam -visa.com where you can issue a visa online. It does look easier than going to the embassy though. It’s definitely easier and faster than via Embassy, specially if you are already travelling and you don’t have a Vietnam embassy close by. Great Information. Once I checked the embassy’s website in the UK. I found out that I can bring the application by person or send it via post. Didn’t know I can get it on arrival too. Just to make it clear, you can’t get the visa on arrival in Vietnam without applying in advance. This website makes the process easy and faster than via embassy, but even though you still need to do some paperwork before flying and getting your Visa at the airport. Hi. My partner and I will be in Vietnam for 2 months starting in June. The Vietnamese Embassy site states that visa-on-arrival is restricted to emergencies and special circumstances. I called the embassy in D.C. And the woman confirmed this. Can you confirm or deny this? Thanks! Thanks for a nice information sharing with us!!!!!! Hi Natalie! You’re so lucky your visa application went without a hitch! During our first trip into Vietnam, it didn’t go so well for us — really tested our patience and wallets! I guess that’s our punishment for not doing our homework very well. My mum wants to go in January, so we’ve no choice but to return. This time I’m doing my research as early as now. Thanks for your recommendation. I hope it goes without a hitch for us this time as well. More power to you, and safe travels! We’ve heard terrible stories about Visa scams… Hope your mum will enjoy Vietnam! Thank you for this info!! You mentioned in your post that there is a new process being discussed. I’m planning on going to Vietnam later this month and was wondering if going through Vietnam-Visa site is still the best option as a US Citizen? For Americans the options are: Apply for the Visa in a Vietnamese Embassy/Consulate or apply online as suggested on the post. Happy travels and enjoy Vietnam! Thanks for sharing nice article, please provide more information about the immigration process. Singha Vip Experience & Carlos Santana Live in Bangkok, that’s how we party!